In 1947, well before their consolidation in 1996, St. Andrew’s and St. Matthew’s were still separate Episcopal churches in Wilmington, Delaware. A group of women from St. Andrews, led by Mrs. Charles Richards, decided to raise some money to donate to a children’s program at nearby St. Matthews. They came up with the idea to have a garden tour, something new to our city. In the first year, seven gardens were on view and $100 was raised. After a couple of years, St. Michael’s School and Nursery became the beneficiary and the Cathedral Church of St. John became an additional sponsor. In the 1950s, houses were added to the tour. In the early 1970s, Calvary-Hillcrest Church and, in later years, St. Barnabas Church became sponsors as well. Today Christ Church Christiana Hundred in Greenville and St. Nicholas, Newark are very involved and are considered unofficial sponsors. By the 1970s, men began taking part and, at one point, there were over 500 volunteers with many churches, Episcopal and others, helping. By the mid-1980s, Garden Day had raised over $1,000,000 cumulatively. Through the years, many members of Saints Andrew and Matthew have headed committees and provided manpower for this tour which has traditionally provided funding for various children’s organizations as well as Friendship House. 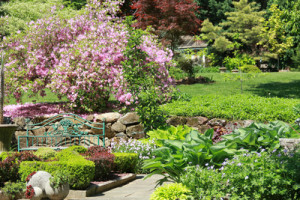 Visit the Wilmington Garden Day website.